1. Operating mode: the initial state, module outputs: normally open (NO) and the common terminal (COM) is disconnected, normally closed (NC) and the common terminal (COM) connected. 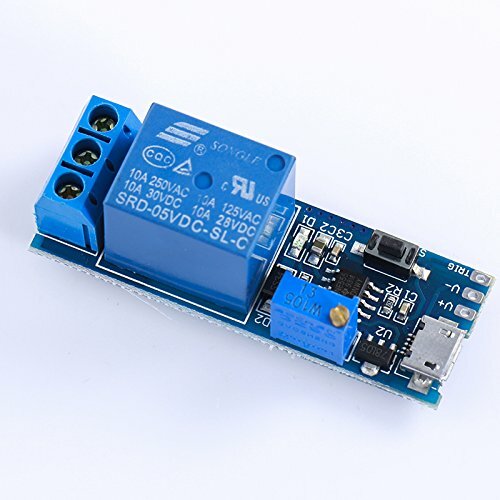 Providing a low pulse signal, or touch trigger key, relay and indicator lights, the output of the state: normally open (NO) and Common (COM) connected, normally closed (NC) and the common terminal (COM) is disconnected. After 0-24 seconds (this time can be adjusted according to your needs) relay off, back to the state before the trigger. 2. The length of timing adjustment by potentiometer, default 0-24 seconds. If you need more time, you can replace the larger capacitor (C2) or potentiometer. Delay time T = 1.1RC. For example: 22uf capacitor and resistor 1M, then T = 1.1 * 0.000022 * 1000000 = 24.2 seconds.